You’ll need Polycarbonate to upgrade your Crafting Bench in The Division 2. Here’s where to get it. The Division 2 really steps it up a notch after you reach level 30. There are now five World Tiers to work through, and if you want to craft usable gear at each stage, you’ll need to upgrade your Crafting Bench. This requires a variety of different crafting materials, some harder to find than others. One of the rarest is Polycarbonate, which must be used to upgrade from World Tier 4 to 5. To help you max out your Crafting Bench, we’ve put together this The Division 2 Polycarbonate Guide. We’ll take a look at how to farm Polycarbonate in The Division 2. We’ll also take a look at all of the ways you can get Polycarbonate in The Division 2. For more on The Division 2, be sure to check out our The Division 2 Guides Hub. It’s where you’ll find all of our The Division 2 Guides content. There’s a detailed breakdown of all the exotics in the game, a look at the best skills, and more. Polycarbonate is a rare resource that can be found in a number of ways in The Division 2. You’ll need it to craft gear, and to upgrade your Crafting Bench. When you hit World Tier 5, and need to upgrade your Bench, you’ll need to have amassed 200 Polycarbonate, no small feat unless you’ve been actively seeking it out from the start. There are a number of ways to get it quickly though, so let’s take a look. There are a bunch of ways to get Polycarbonate in The Division 2, but generally it is not dropped from enemies. You’ll need to loot the environment to get most of it, which is aided by resupplying control points on the map. You can also get it for dismantling certain armor, though this is certainly not the best way to get it. 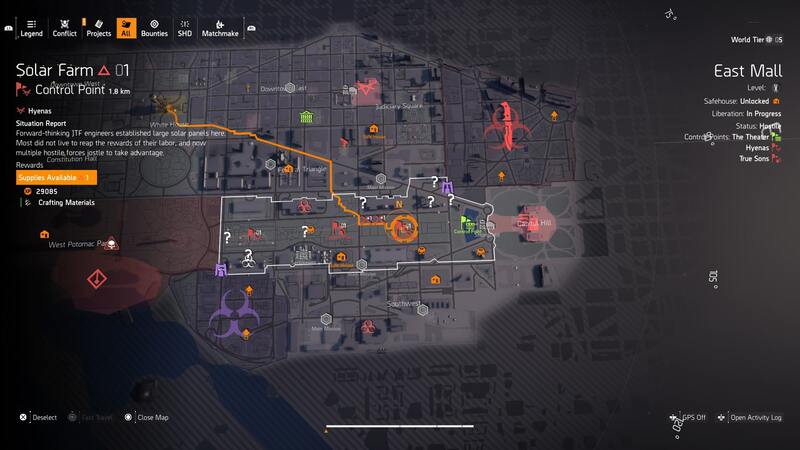 The very best way to get Polycarbonate in The Division 2 is to do Control Points. Specifically, you’ll want to do Hyena controlled Control Points. The best one that we found is called Solar Farm, and can be found in the southeastern part of the map. We’ve included a screen below. What you’ll want to do is take over the Control Point and then head to the Control Point Officer. Donate resources until you trigger the Awareness Perk. This will highlight loot in the area, of which there is a tonne. We managed to get around 90 Polycarbonate by looting this point, and then the area to the East. These stocks refresh every 24 hours too, so keep grinding and you’ll have all that you need in no time at all. Another great way to get Polycarbonate is to head down into the underground. There’s a lot of loot down here, and a high potential to get Polycarbonate. We recommend tying this in whilst looking for keys. Two birds with one stone, so to speak. Finally, you can deconstruct Chest Armor to get Polycarbonate. This is not the most lucrative method by any means, but if you have a backstock of gear then be sure to deconstruct as much as possible. Legendary Chest Armor in particular, appears to drop plenty of Polycarbonate. If you have your uPlay account linked to The Division 2 then you can spend 20 credits to get 30 Polycarbonate as part of the Standard Materials Pack. This can only be redeemed once, but if you have spare credits lying around, this is a great way to spend them. If it's more Division 2 coverage you're after here at USG, then we've got just the guides for you. You can check out our Division 2 Exotics guide for some elite weapons, or the Division 2 character customization guide for more. Alternatively, if it's levelling information you're after, there's our Division 2 Skill Power guide, or our Division 2 XP levelling guide. Elsewhere, there's also our guide on where to get all of the Hunter Masks in The Division 2, as well as our breakdown of The Division 2 Dark Zone. In our The Division 2 Guides Hub you'll find all of our The Division 2 guides content, so be sure to check it out.